I'll bet this photo (Photo #1) got your attention. I added the black bar is because I'm tired of looking at myself. And if I feel that way now, you must have reached that point of saturation many years ago. Today's post is about getting the most from a single, battery powered speedlight or flash. When working outdoors you must often compete with high levels of ambient light, which means that you'll need to push a lot of light onto your subject if you expect to subjugate that pesky sunlight. In past photos, I might use a flash with a light output nearly triple that of a shoe-mounted speedlight. But by keeping a spare Nikon body capable of conventional flash synchronization at short, and super-short, exposure times, you can get a leg up when wrestling with the sun for a proper exposure. I normally carry a Nikon SB-800 speedlight as part of my weekend Nikon D70 kit. While the convenience of iTTL (intelligent Through The Lens) metering at 1/500 of a second can be a joy beyond words, that shutter speed setting, while a full stop better than nearly all of the other Nikon DSLR bodies, is something of a short leash so far as flash is concerned. As I mentioned in earlier posts, I absolutely love the D70's ability to sync at all shutter speeds. Unfortunately, when the SB-800 is mounted in the camera's hot shoe, the top sync speed is 1/500 of a second, the maximum sync speed where the D70 supports iTTL. This is not true for nearly all other Nikon bodies which sync at 1/250 of a second, or lower. If I'm going to make up for the power limitations posed by a single speedlight, I'll need some way to work around this limitation. By using way short exposure times, the corresponding aperture gets larger and larger, allowing for one flash to have a greater influence on the foreground exposure. Tape the contact. Take a tiny piece of electrician's tape and cover the SP contact. Not one of my faves. I'm always on the lookout for any modification that can simplify my photographic efforts. My newest work-around involves an MPEX Universal Translator, described in this Strobist posting. The Translator is primarily used to join a camera and an off-camera speedlight using either a 3.5mm mini-microphone cable or a standard PC connector, the former being significantly cheaper and more reliable than the latter. In actual use, you simply buy two Translators: one for the camera and one for the flash, and a male-male 3.5mm microphone cable in a length you can handle, or just buy the starter kit here. 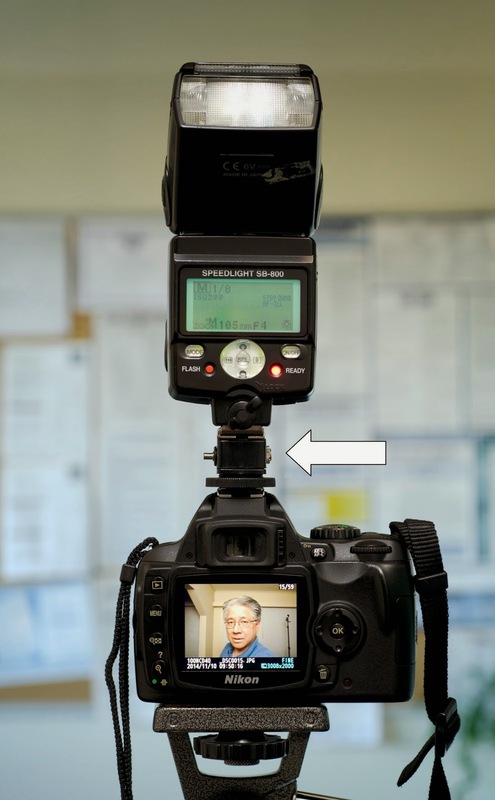 If you look at Photo #2, you can see that the Translator is installed between the speedlight and the hot-shoe (see arrow). Be sure that you tighten the retaining screw on the Translator and flip the lock lever (or tighten the speedlight's retaining screw) to minimize slippage. But be very careful, just the same. One reminder: to connect the translators or the translator and an off-camera LumoPro, you'll need a 3.5mm Miniphone male-male cable (included in said kit), and a male-female "extension" cable in any length you can stand. Now here's the cool part. The Translator does NOT have an SP contact. This means that it can fire a flash, but not much else. Now when my shoe-mounted SB-800 tries to tell the camera body, "I'm here! I'm here!" nobody's listening. When the Translator sits between the hot shoe and the flash foot the D70 body can sync at any speed you wish, provided that the selected exposure time is longer than the flash output. 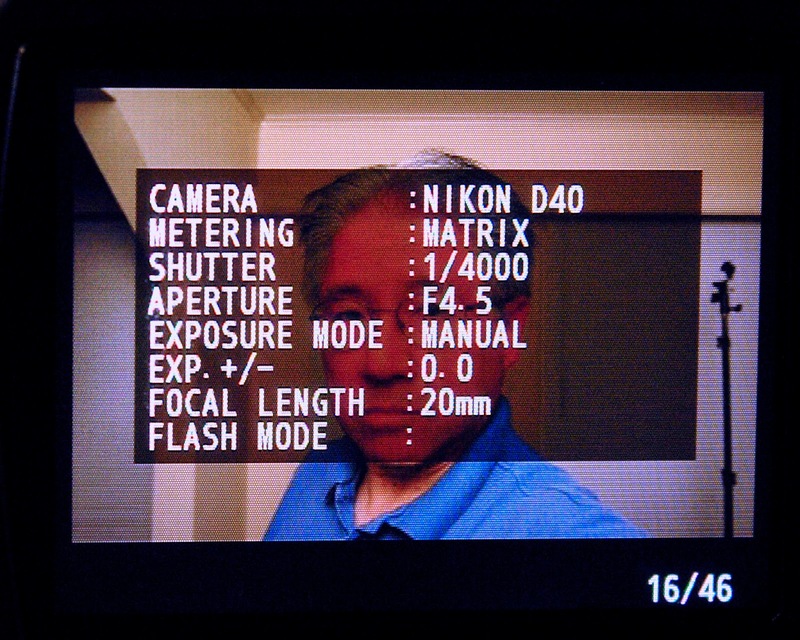 This screen capture from a Nikon D40 shows a sample selfie (Photo #3) taken indoors using a SB-800 set to 1/8 power, a beam spread of 105mm, and aimed at the juncture of back wall and the ceiling. It could have been made with any flash or speedlight with a light "burst" duration of less than the exposure time. And while this particular shot was made with a Nikon D40, it could have been done with a D70/70s or D50 just as easily. Again, the high speed synchronization speed trick only works with this family of Nikons, although there is one Canon, an early 1D series, that allows similar high speed synchronization. I know this doesn't illustrate the outdoor potential of the flash, but illustrates that you can use this technique to get shots you might have thought impossible without a very VERY powerful flash. One other thing: If you have a speedlight in the Translator's hot shoe, there's no reason to not add a second speedlight using the mini-microphone jack and your extension cable. That's a lot of light to work with when you consider the potential for short exposure times (or high synchronization speeds) and fairly large, open apertures. Installing the Translator is just a convenient way of accessing those super sync speeds when on-camera flash is required and your using a iTTL Nikon speedlight. I am not advocating direct flash. Quite the contrary, this trick simply allows you a bit more exposure flexibility when using bounce flash. Sure, you give up the exposure automation, but gain a lot of exposure options past 1/500th of a second. Incidentally, I leave it to you to be more creative when using this "hack" than I was. Warning: If your speedlight has a Standby (power-save) mode, be sure to set it to OFF. If the flash goes to sleep between shots, the camera can't send a "wake up" call through the SP contact. This gambit helps a bit, but you may be forced to do an "off-on" sequence to get the ball rolling once again.The only 100% reliable units have been those units that have only the trigger contact, and nothing else. Of course, these units wouldn't need the Translator hack anyway. Amendment: November 17. The Nikon SB-24 does have the SP contact, but an analog Standby (power saver) setting. When set to the conventional "on" position, the unit, coupled to the MPEX Translator, worked every time. 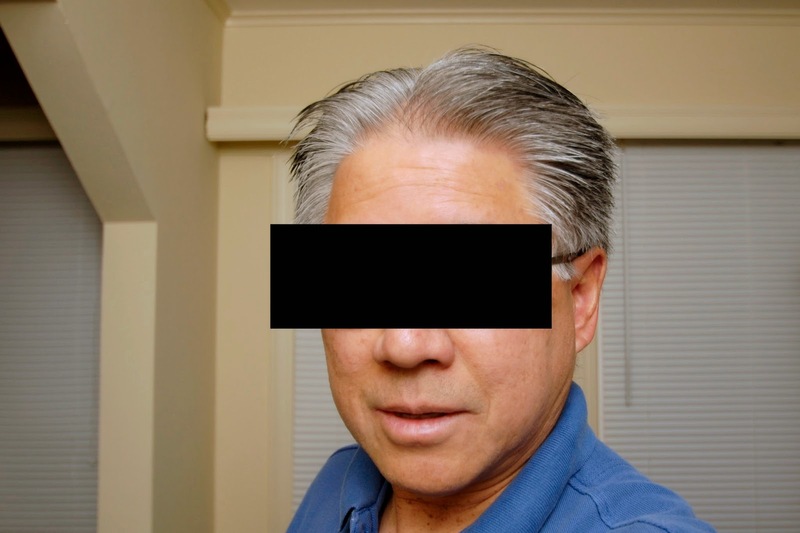 I surmise that the Nikon SB-26, my favorite pre-iTTL speedlights, will function in the same manner. *I use the word "hack" to mean, "an action that gives capabilities to a device unintended by its designer". I feel the word is correctly used in this case. I'm sure others won't agree.